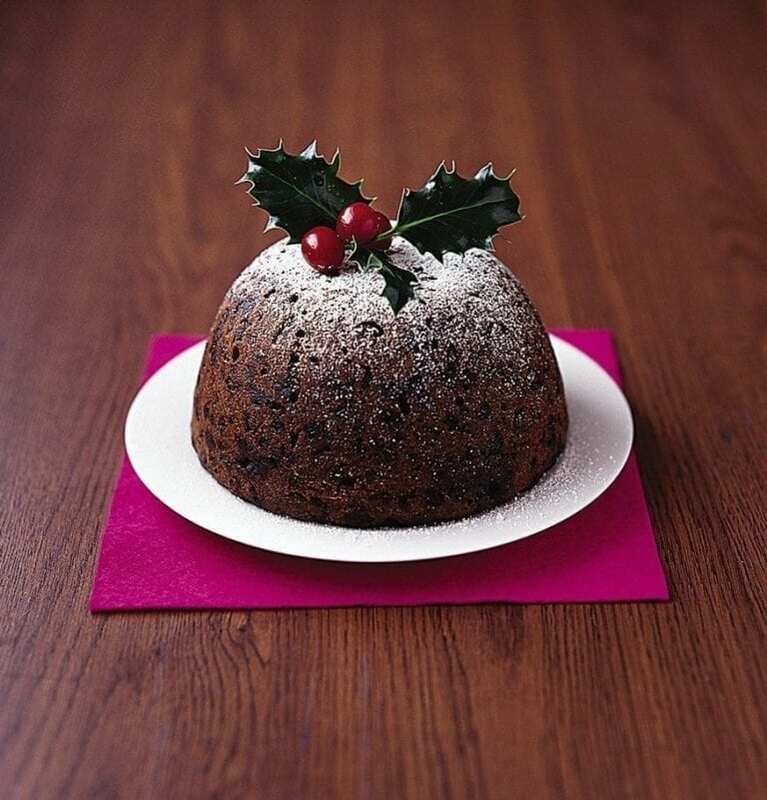 You can’t go wrong with this traditional Christmas pudding recipe – make two large puds or twelve small ones. Preheat the oven to 180°C/fan160°C/gas 4. Put the dried fruits, peel, zest and juice, milk and brandy in a large bowl and mix together. In a separate bowl, sieve together the flour, spices and a pinch of salt. Melt the butter in a small pan, then cool slightly. Pour over the dried fruit mixture, then add the breadcrumbs, eggs, muscovado sugar and the spiced flour. Mix well, so there are no pockets of flour left. Grease and base line 2 x 2-litre pudding basins divide the mixture between the pudding basins. Level the mixture and cover each using a circle of foil that’s larger than the basin. Make a pleat down the centre of each. Tie string around the rim of each basin, then loop over and tie at the other side to make handles. Take 2 saucers and put one each into 2 large, deep saucepans. Sit the basins on top and fill each pan with boiling water so it comes halfway up each basin. Cover the saucepans with a lid, bring to the boil, then reduce to a simmer for 4 hours. Turn out, dust with icing sugar and serve decorated with holly and cranberries. Alternatively, put the puddings (still in the basins) on a wire rack to cool completely. Turn out, wrap in greaseproof paper and foil and store in a cool place for up to 6 months. To serve, reheat in a saucepan of water (the same way you cooked it), until piping hot to the centre – about 1 hour – and serve as above. Grease and base line 12 individual dariole moulds, divide the mixture among the dariole moulds so each one is just over three-quarters full. Cover each with a circle of foil with a pleat down the centre, then put in a roasting tin. Fill the tin with boiling water, so that it comes halfway up the moulds. Cover the whole tin with foil and transfer to the oven for 1½ hours. Insert a skewer into the centre of a pudding – if it comes out clean, they’re ready. Remove the moulds from the tin and cool a little. (Alternatively, cool completely, turn out, wrap in greaseproof paper, then foil, and store in an airtight container for up to 3 months. To reheat, return to the moulds and heat for 1 hour, the same way you cooked them.) Turn out the puddings and top with a scoop of ice cream. Our editor Matthew Drennan’s mum has cooked this wonderful light pudding for more than 40 years. Steam in 2 x 2-litre pudding basins or, even easier, bake in 12 dariole moulds. Large puddings will keep, in an airtight container, for 3 months.